I am often inspired by a good read and I am an equal opportunity reader. I love both fiction and non-fiction books and find that both can ignite my creative capacities. Through fiction, I escape the day-to-day to walk in a character’s shoes and visit places unfamiliar, perhaps discovering an interesting metaphor that results in a richer understanding of the world around me. Encountering new perspectives from an expert in another field and reading about real-world stories and events are a few things I appreciate about non-fiction reading. These too can lead to richer understandings. Here’s a list of books on my radar presently (some in the mail as I write) for which I have high expectations of stirring my creative spirit. After you take a look at this list, then share with us what’s on your bookshelf or nightstand that is provoking you to think in new ways and see the world with fresh eyes? 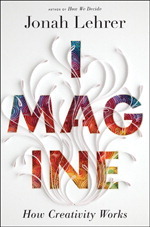 Imagine: How Creativity Works by Jonah Lehrer – This one comes out in March, 2012 and is the third book written by author Jonah Lehrer. Lehrer has a background in neuroscience and a strong interest in the relationships between art and science. In Imagine, he discusses new science about creativity and proposes that all of us can achieve increased creativity through effectively using a distinct set of thought processes. Lucky for me (and others), Lehrer will be in Dallas on March 23, 2012 presenting at the DMA’s Arts and Letters Live programming. 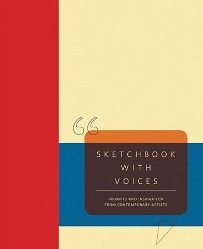 Sketchbook with Voices by Eric Fischl and Jerry Saltz – This collection of prompts from contemporary artists was compiled in 1986 by Fischl, an artist, and Saltz, an art critic. The book was reprinted this year and I discovered it recently as I ambled through a museum gift shop. Full of empty, ready-to-be-filled pages, this sketchbook includes inspirations from artists such as Richard Serra, Susan Rothenberg, and John Baldessari. 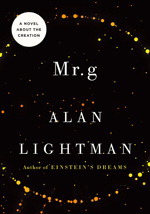 Mr. g by Alan Lightman – This is the forthcoming book from one of our department’s favorite authors! Remember the recent post about Einstein’s Dreams? We cannot wait for Lightman’s new book to come out in January, 2012. Lightman, like Lehrer, is a scientist intrigued by the blurred and crossing boundaries of art and science. However, Lightman explores these ideas through novels and in Mr. g, the story of creation is told, as narrated by God. Alan Lightman is also coming to Dallas next year! On May 20, 2012 Lightman will be the featured author for Arts & Letters Live. The Toaster Project by Thomas Thwaites – This is a recent addition to my “books to read” list. I heard about it the other day on the radio and love the curious story behind the book. In pursuit of wanting to know more about where things come from, Thomas Thwaites decided to build a toaster from scratch…. These all sound really fascinating! I’ve actually compiled a lengthy book list based on some of the amazing authors coming for the 2012 Arts and Letters Live series and passed it along to Santa Claus 🙂 So I hope to be spending my holiday snuggled up by the fire with a pile of books, can’t wait! 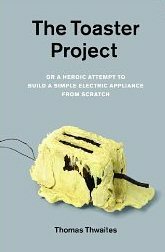 I am really intrigued by what that toaster on the cover of “The Toaster Project” is made of…dough? Terrycloth? Glue? I enjoyed your article Nicole, but I just can’t take my eyes off of that toaster!